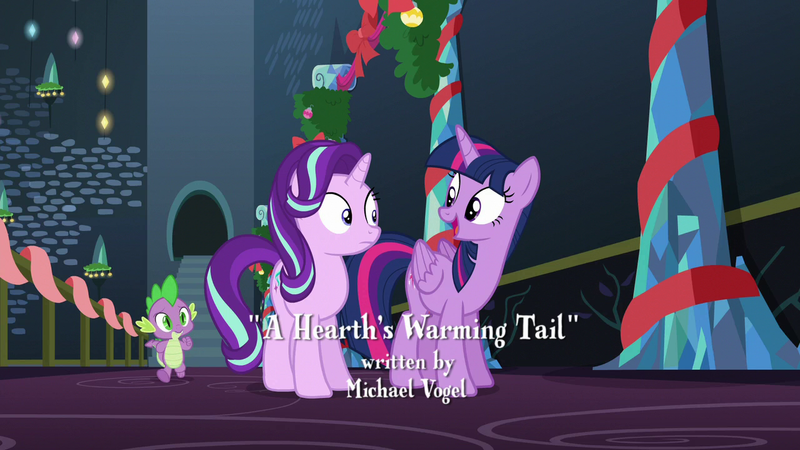 Determined to share her holiday cheer, Twilight offers to read her “favorite Hearth’s Warming story.” Of course, it’s a pony-fied Christmas Carol. And it’s a ton of fun. Of course she’s visited by spirits. 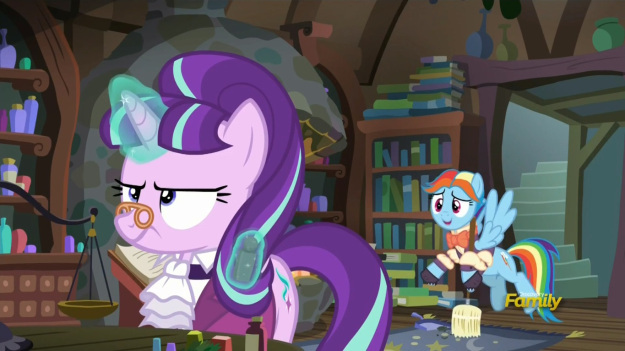 Applejack appears as the spirit of the past, introducing a sequence in which young Snowfall learns to disdain frivolity in the interest of getting ahead. Her song about the seeds of the present sown in the past is sad and sweet. 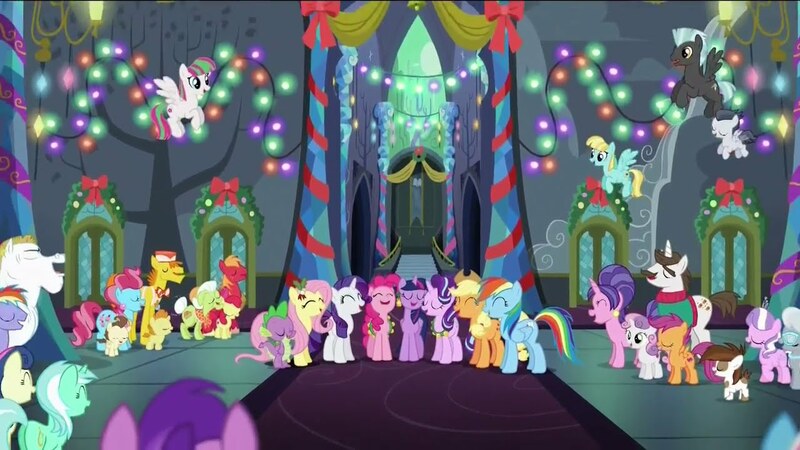 Pinkie Pie plays the boisterous spirit of the present, and Rainbow Dash appears as a Cratchit analogue, albeit with friends, not a family or kids. Snowfall begins to doubt her previous position when she sees ponies sharing love and friendship. But of course we have one more spirit, and there’s only one character who will do. Luna plays the properly scary third spirit, pronouncing a future full of sorrow, strife, and a frozen wasteland. 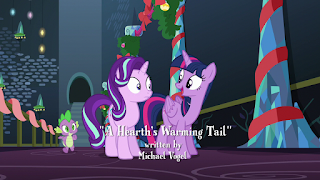 Because as we know from the aforementioned founding of Equestria story, the love of Hearth’s Warming Eve literally keeps freaking magic ice monsters from taking over the world. Naturally Snowfall panics, but she is able to prevent her spell from completing, and joins the others for a party. 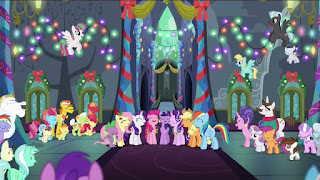 Back in Ponyville, Starlight also decides to join in the festivities. Erin brought up a good point: one way to interpret this episode is that you should pressure your friends to celebrate your holiday, and that’s not really an okay moral. I am of the opinion that Starlight was more shy and self-conscious about her perception that the holiday was for little kids than she was openly opposed to celebrating, and Twilight doesn’t in the end pressure her to come to the party, just ensures that she knows she’s welcome. I can see reading it the other way though.